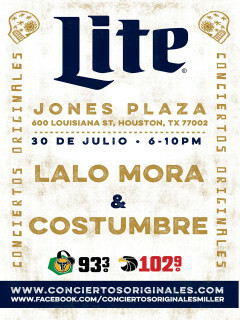 Miller Lite Conciertos Originales (Original Concerts) concert series returns to Houston to bring legal drinking age consumers a norteño power lineup: Lalo Mora and Grupo Costumbre. Mora, better known as the King of Thousand Crowns, will share the stage with Latin GRAMMY® Award-winning Grupo Costumbre to bring fans in the Houston area a free, original concert experience. The first 100 people that arrive will gain VIP Access with food and beverage included, all courtesy of Miller Lite. Must be at least 21 to attend.